Gaming firm Play'n Go may be from Sweden but this particular game, Fodseldagen, pays tribute to their neighbours Denmark. The word 'Fodseldagen' translates from Danish simply as 'birthday' in good old Anglo-Saxon. So can this celebratory vein continue? 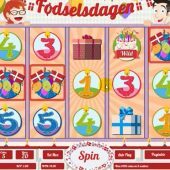 Fodselsdagen slot is a straightforward 3-row, 5-reel game with 20 paylines. The base game symbols are candles with the numbers 1-5 on them or gift boxes for the higher-paying ones, the best paying 50x stake for 5-of-a-kind (5OAK). There are non-multiplying Wilds on all reels of which a 5OAK pays a handsome 250x stake. There is unfortunately a hugely irritating Scandi-Folksy guitar strum initiated on each spin, possibly to help you lose money quicker by encouraging you to stop the reels in order to end the assault on your ears. There are 2 features on the Fodselsdagen slot. The first is initiated by landing 3 or more birthday cocktails with Danish flags. You will get a pick for each Danish scatter from a series of birthday presents. When you've picked them, each present opens to an annoying blow of a party whistle and 'Happy Birthday!' in English! You will find 2-100x stake in each box so there is a decent award possible. Should you land 3 guitars (which I personally would have done a Richie Blackmore-style smash with to end the base game strumming) you initiate 10 non-retriggerable free games. There are no mulipliers and the only bonus is that the guitar scatters become extra Wilds. If I though the irksome qualities of the game were over, I was wrong - the reels and symbols inexplicably turn pink during the free games, making it nearly impossible to discern a win dropping before the game starts counting it up. Fodselsdagen slot is the equivalent of those birthday socks your gran gave you when you were younger. You hide the disappointment and silently consign them to the back of the drawer, hoping to never see them again. A tedious pick-me and a dull free spins round are certainly providing the icing on the cake... Play'n Go have some much better slots such as the cartoon-inspired Energoonz or the slightly dark Grim Muerto slot.